Adventure Sports II has everything you need to make the most of your water sport activities! 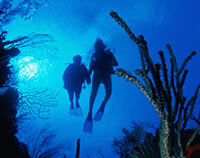 Adventure Sports II Inc. has been sharing scuba diving adventures with local residents since 1989. We love introducing people to the beautiful, underwater world. With our highly trained instructor staff, Adventure Sports II offers a variety of training levels from Snorkel Diver to Instructor! And we don't stop there! Adventure Sports II Club Aquarius keeps its members wet throughout the year from local trips and activities, and dream vacations to exotic destinations. Come along! Join Adventure Sports II for a lifetime of fun and adventure! Bring your family and friends!